November, 1992. It had been less than a year since Freddie Mercury’s premature death, at the age of 45. The anniversary was fast approaching, and the moment would be marked with a controversial compilation of brand new remixes from his brief solo back catalogue. In retrospect, it’s easy to see that whilst it had to be marked in some respect, the anniversary could easily have ridden a tidal wave of Mercury-induced fatigue in the general public. Queen had started the year atop the singles charts with the reissue of Bohemian Rhapsody, whilst Greatest Hits II rode the crest of the nation’s grief for their fallen idol, also returning to the top spot over the festive season. A few months later, and Queen almost topped the album charts again, with the release of Live At Wembley ‘86. Before that came a concert in Freddie’s name at the same venue, featuring a host of big name stars performing Queen classics to a worldwide audience of 1billion. That Summer had also seen a reissue of Barcelona - Mercury’s duet with Spanish soprano Montseratt Cabelle - reach #2 in the UK Top 40. Queen were bigger than ever: Freddie, perhaps even more so. 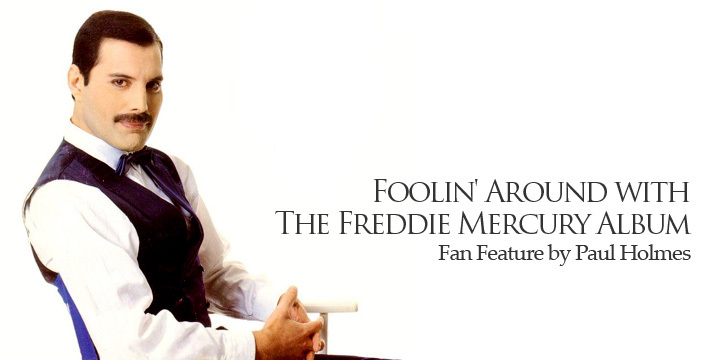 To this particular young fan, just about to celebrate his eighth birthday, and for whom the events of November 24th 1991 had been a shocking introduction to the concept of grief, the release of The Freddie Mercury Album was the best possible thing he could spend some of his birthday money on. That his parents managed to persuade a local record store to give them a promotional poster and cardboard cut-out instead of chucking them in the trash made this album feel all the more special. Here were a selection of songs he had never heard before, sung by that incredible man who had him transfixed since I Want It All had premiered on The Chart Show. The names were familiar from the tribute magazine discographies - a word he could barely pronounce, yet was already fascinated by. Titles like Your Kind Of Lover and Foolin’ Around meant very little to him. He was, after all, eight years old. But Mr Bad Guy… now that was something to fuel the imagination of a primary school boy who would try and copy the Queen logo onto his pencil case and had claimed every Queen record he could find in charity shops and on second hand market stalls, in-between getting new records and videos for birthday and Christmas presents even before this wonderful man had been cut down in his prime. The Mr Bad Guy project had been a mixed bag of results for Freddie, it seems. At times, his boundless energy was poured heart and soul into the project, creating some of his best work. At others, as Rhys Thomas excellent new documentary The Great Pretender reveals, he was already too busy thinking about his next project to really give it his all. By the time the album came out, his disinterest, and lack of any real promotion, made it sink without much of a trace. Here then, was a chance for the general public to become more aware of songs which had failed to light up the charts in 1985, alongside a select bunch of additional tracks to bump up the running time. Original masters of The Great Pretender and Love Kills sat side by side with brand new remixes from Nile Rodgers, Ron Nevison, Steve Brown, Julian Raymond and Jeff Lord-Alge. Barcelona was in the mix too, as was, rather oddly, Exercises In Free Love. Hindsight - and the advent of forums -has made it clear that the new versions of old tracks were not met with the approval of some die-hard Queen fans -who bombarded the band’s manager, Jim Beach, with hate-mail. Yet, as Freddie is quoted as telling Beach: he could do anything he wanted to his music, as long as he didn’t make him boring - and the album could never be accused of that. What is clear is that the production techniques on Mr Bad Guy are an acquired taste. The synth-heavy, Donna Summer-esque arrangements are sparse and hollow - and coming to them after the 1992 versions, they have always felt a little undercooked. Queen themselves reworked two further Mr Bad Guy tracks from the ground up, making them much loved parts of their canon, yet when similar efforts were made for this release, the results were mostly unloved. Sure, there’s an argument that the new versions of songs like Foolin’ Around, with its pad drums and 90s keyboard sound, have dated even more than the originals, which seem to dive in and out of fashion every few years when current pop-stars decide to pay homage to the early 80s. And nothing quite screams of 1992 like the 2 Unlimited style Europop of Jeff Lord Alge’s remix of Let’s Turn It On! Yet some tracks, given a less sparkly reworking, positively bristle with energy and vibe which the originals can never quite muster. Already a brilliant recording, made for the 1986 Time project, Ron Nevison’s remix of In My Defence is a bombastic treat - far closer in style to a Queen recording than the original, and all the better for it. Similarly, tucked away on its b-side was a stonking great rocked up remix of Love Kills by Richard Wolf, which can’t quite hold a candle to the original but takes the song into new territory with vastly enjoyable results. There were more remixes beyond this, and the ones contained within the album. Many years later, the US version of the album, dubbed The Great Pretender, would be reissued in the UK, and bring with it powerful reworkings of The Great Pretender and My Love Is Dangerous which offered fine takes on the gems within Mercury’s back catalogue. The following year, yet another remix would find itself sitting atop the UK singles charts, as No More Brother’s take on Living On My Own put the original version’s paltry showing at #50 back in 1985 to shame. As the years go by, and Mercury’s musical endeavours outside of Queen are given fresh light via a new record label and even a full orchestral reworking of his superlative Barcelona project, it’s easy to forget the impact The Freddie Mercury Album had on the British public, and on those who were too young to remember the songs the first time around. To this young fan, the songs contained on these two sides of vinyl were committed to memory, recorded to both sides of a C90 to play on his walkman, and sung at the top of his voice whenever the opportunity arose. And unsurprisingly, Mr Bad Guy became an instant favourite. Stripped of its faux orchestra, but supplemented with fat percussion and riff-tastic guitar work, the track was everything I anticipated and then some. Yet its lyrics confused and fascinated me. Did Freddie really see himself as a villain? Was he really a villain? That was certainly how some wanted to see him, but a voice that beautiful, unlike anything I had heard before (or ever since), couldn’t possibly belong to someone bad. As I matured, and learnt more and more about the man who shaped my musical landscape, I learnt Freddie Mercury was many things, but a bad guy he certainly was not. Nor was The Freddie Mercury Album the crime against his music which many fans seemed to think, and perhaps continue to believe. There have been better retrospectives of his back catalogue in the last fifteen years or so, and no doubt there will be many more to come. Yet in 1992, this record was exactly what Joe Public needed to fall in love with his solo work at long last. Whilst it may no longer be a regular spinner on most people’s turntables, cd players or, more accurately these days, iPods - it remains a near perfect time capsule of that strange period when we couldn’t quite believe he was gone, and welcomed an excuse to pretend dear ol’ Fred was still around. Long may he be.